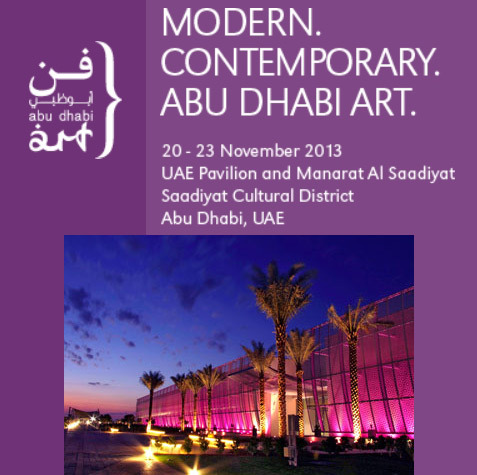 The fifth edition of Abu Dhabi Art Fair from November 20-23, 2013 will take place at Manarat Al Saadiyat. Leading international and middle eastern art galleries will participate in five sections Modern and Contemporary | Design | Beyond | Bidaya | Signature. The Abu Dhabi Art Public Programme is a corner-stone of the wider Abu Dhabi Art platform, which includes a dynamic, interdisciplinary set of initiatives that bring together influential artists, curators, collectors, gallerists and scholars from around the world. This year, the programme highlights a number of important themes, including the discovery of new art and artists; transnational perspectives on the notion of value and the various ways it created; and considers the shifting scale of art – from architecture and monumental public works to art that sits in the palm of your hand. Audiences are also invited to take-in an expanded and innovative performing arts platform taking place throughout the fair and stretching beyond into the city of Abu Dhabi. In the plaza, audiences will be presented with an exciting programme of new video works, dance and music performances as part of Art, Talks & Sensations: Dunes and Waves curated by Fabrice Bousteau. A performing arts initiative titled Durub Al Tawaya, will feature cultural happenings, performances and artistic interventions that expand into the city of Abu Dhabi. The programme, curated by Tarek Abou El Fetouh, will invite people on a journey to various communal spaces in the city including Manarat Al Saadiyat, Mina Zayed, Corniche Beach and Marina Mall. A special parallel presentation of the Guggenheim Abu Dhabi: Talking Art Series, a set of in-depth transnational discussions between leading curators and artists whose works are part of the Guggenheim Abu Dhabi permanent collection, will be part of this year’s talks.